Iowa is rich in heritage and history, from Cedar Rapids’ Amana Colonies to the glaciers that cut through the earth millions of years ago. 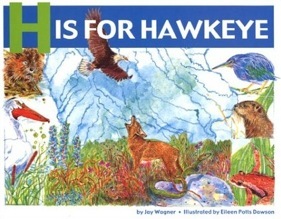 In his first book “H Is for Hawkeye ,” native Iowan and journalist Jay Wagner brings the best of Iowa to life in a new children’s book filled with facts and flavor with colorful, detailed sketches and paintings by illustrator Eileen Potts Dawson. Each page of the “ABC” children’s book is a feast for the senses with text offset by a number of bright images, a hand depicting each letter in sign and names of each letter’s towns scripted along the page’s perimeter. Author Wagner — who grew up in Sibley and whose parents own newspapers in Sheldon — says he has a passion for the state and wanted to write a book that would appeal to both children and adults. Trails Media Group of Wisconsin approached Wagner with the idea of writing the book because of his extensive association with Iowa. Wagner edited the Iowan magazine for four years and spent six years with the Des Moines Register as a roving reporter. He also worked for his family’s newspaper and for the Sioux Falls Argus Leader, and has been published in Newsweek and The New York Times. Potts Dawson — who has illustrated many Trails books — was a logical choice for the midwestern theme and complimented Wagner’s subjects by collaborating with him on pictures needing inclusion. “She read my text and then did research on her own, contacted people and got pictures for the book,” says Wagner. Those pictures, in turn, sparked a host of ideas and three were used as reference for their illustrations. The result represents Iowa as a state notably credited with much of U.S. history. In “C is for caucus,” Wagner describes the thousands of people who every four years meet in homes and public places to decide on whom they want to run for president. In “E is for effigy mounds,” he explains how the Native Americans, almost 3,000 years ago, began building special mounds of earth throughout the Great Lakes region. Illustrations depict several of those mounds in various shapes such as eagles and falcons and what some believe are burial sites for special ceremonies. Wagner also ran the book by his own two children – ages 2 and 4 – though the book is geared more toward school grades first through third. Both author and illustrator felt the inclusion of sign language was important and “very Iowan,” noting that Iowa Sen. Tom Harkin authored the 1990 Americans with Disabilities Act. In “V is for very important Iowans,” Wagner also pays homage to other leaders such as Carrie Chapman Catt, who fought for women’s rights and grew up on a farm near Charles City, our 31st president Herbert Hoover and the five Sullivan brothers, who died together on the same ship during World War II. In writing a book for children, says Wagner, one first has to know and understand kids. And, he adds, it takes a lot of practice. Equally important is having an outlet for writing and finding other writers with whom one can bounce and exchange ideas.